Miles Davis once said that the hardest thing for a musician to do is to sound like himself. In this case, Jumaane Smith knows what he wants. He is more than a trumpet player. He sings, writes songs, scores for films- he can even can play drums. He has so much range that he can go from playing with a legend like Stevie Wonder to a current day star the links ofJustin Bieber. And has done both. With a career already established as a supporting act and band member, Smith is ready to take the music world by storm with his soothing jazz playing bringing an old school jazz vibe with a modern twist- as a solo artist. “I do agree about finding your voice, but it comes from a lot of studying,” Smith says. “It’s like a surgeon performing a surgery. You don’t go into the surgery without the knowledge.” he says a-matter-of-factly. Smith is a talent to be reckoned with. 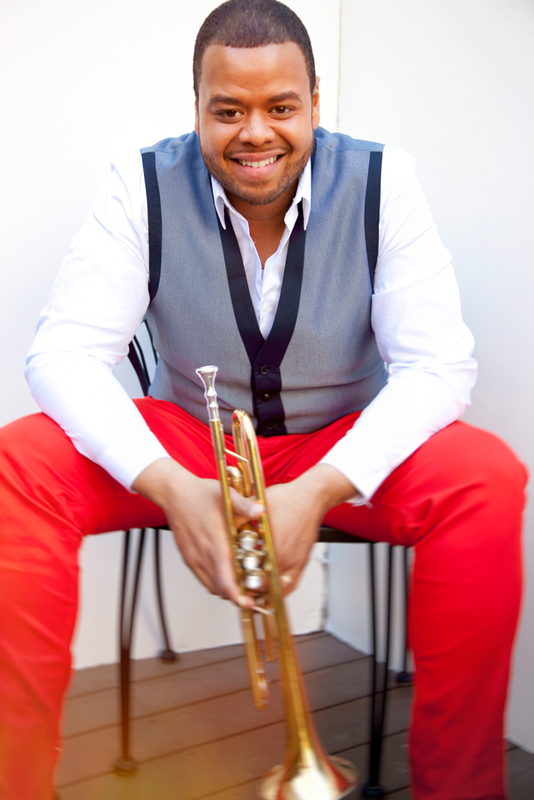 He is a trumpeter and vocalist. He has played with the likes of Michael Buble, Jackie Evancho, Quincy Jones, Alicia Keys on her album “As I Am” Diddy, Bieber, as well as Wonder and the Jonas Brothers. But where does all this ambition and talent come from? Smith got interested in music at the age of three, playing piano and the drums. But this time he gets to grace the stage as a solo artist. His debut album, “I Only Have Eyes For You” is a collection of covers featuring duets with Buble and Jackie Evancho. “It was a dream of mine do a solo album,” he says enthusiastically. “I wanted to make an album that has depth and was familiar but brought you to someplace else. It took a long time to evolve it what it is. But it’s an album that’s from my heart and I put a tremendous amount of work into it. When I got to with Jackie Evancho I worked with an orchestra which was a great experience. I love all the songs on the album. I love the sentiment of the song Dream.” he says proudly. The album features his renditions of classics such as “Georgia On My Mind,” “La Vie En Rose,” in which Evancho sings beautifully on. It also includes “Come Rain” or “Come Shine” featuring Buble. Smith has also started work on his sophomore album, one which he wants to showcase his songwriting. In the future Smith would also like to score more for films and he has a dream job he hopes he can land. He wants to play with the Roots and he would like to work with Herbie Hancock again. He also had a chance to work with the late Amy Winehouse, but before anything can happen she passed away. “I got a call to do some work from this guy from Amy’s horn section but the scheduling wasn’t right” he said with a sigh. He would like to introduce jazz to a wider audience and get young people interested in the genre. Now on tour with Buble, his future ahead looks to be very busy and fruitful as he gets ready to finish his second album. But unlike many other artists only on their second album, Smith’s success as a supporting player have played a crucial role in his confidence. The recordings Smith has been featured on have sold a remarkable twenty-five million copies and has earned four Grammy nominations and won three Grammys.